His & Hers Review: Anatomicals and Manatomicals! This week Jon & I are reviewing different products from the same brand - I am reviewing Anatomicals range of face masks, and Jon is reviewing Manatomicals body wash range! Like any self-respecting beauty mad blogger, I ADORE a good old fashioned pamper night - my idea of heaven is a long soak in a hot bubble bath with a nice face mask on. 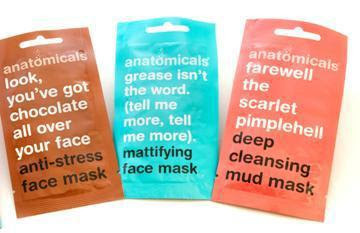 So I was THRILLED to try out these masks from Anatomicals - I love the fun, quirky names given to each of them (Grease Isn't The Word being my favourite!) and I was really looking forward to seeing what results I would get from each of them. I love the convenience of face masks in little sachets like this, as they are cheap & cheerful meaning you can pick up lots of different ones and experiment rather than splurging on one big bottle of the same product! They are also really easy to store if - like me - your bathroom cabinet is becoming a bit full!! The first one I tried was "Look, You've Got Chocolate All Over Your Face" Anti Stress Mask. This mask contains dead sea salt, cocoa and shea butter for moisturizing and healing and promises to leave skin feeling de-stressed and glowing. I would advise you to be a bit careful when opening the packet, and the mask itself is quite a runny consistency - it looks just like melted down chocolate and really did smell good enough to eat! The masks are so easy to use, you just wet your face and pat dry, then apply the mask - it was really easy to apply and there was PLENTY of it so I got a really good coverage out of it. Infact there was lots left in the packet once my face was well covered! I laid back in the bath and just relaxed ... the mask had an almost warming sensation to it after about 10 minutes or so, and the smell of melted chocolate kept filling my nostrils - really lovely! After the 15 minutes was up, they advise you to use a wet cloth to dampen the mask and then rinse it off. As it was such a dark mask I thought it would be very messy but it wasn't at all and was really easy to rinse off! My skin felt lovely and smooth afterwards, and Bean Daddy commented that I looked really refreshed and that my skin looked matte and calm! Last night, I tried "Grease Isn't The Word" mattifying face mask. Enriched with algae extract and wheat protein, this mask is designed to tighten pores and moisturise dry skin. The first thing that struck me was the colour of the mask - it was the same colour as the packaging, almost a spearmint blue. It felt very smooth to apply, and my skin tingled straight away - with all of the Anatomicals face masks I have found that there is plenty left in the packet once my face is covered - which is a nice change from the Montagne Jenesse masks which I find don't contain nearly enough product to get a decent coverage!! The mask dried quickly, within about 5 minutes, and I could really feel the tightening sensation. Unfortunately I made the silly mistake of reading a sad book while it was on, and I shed a few tears - I thought you might be interested to see what happens when you cry while wearing the face mask - so here you go!!! Me after crying on the mask! I washed the mask off after 15 minutes, it was very easy to remove and my skin felt really smooth and refreshed afterwards. I definitely noticed more of a matte look and my make up took really well afterwards. All in all, I have really enjoyed using the Anatomicals masks and I will 100% be purchasing more of them! Anatomicals Face Masks are available from Boots & Superdrug at just £1 each! As you may or may not know, I'm a sucker for packaging, and neither one of these products fail on that front. Both bottles contain the usual witty play on words and fun graphics you expect from Anatomicals. These combined with matte black background and vibrant colour lettering giving each product a masculine, yet fun, funky, modern appearance. Whilst both are body washes, they are very different products and should not be confused with one another. The first one is is labelled as Fresh and the pitch boldly states 'You're no ones beau with B.O'. The description on the rear of the bottle gives a very tongue in cheek history lesson about 19th Century hygiene. Unlike the hygiene of the 19th Century, this is very clean and fresh smelling. A fresh, yet not overly powerful scent. It's subtly perfumed, and the product itself feels thick, non-greasy and very high end when in use. Upon using the product for the first time I was left feeling refreshed and smelling good, so good in fact, Bean Mummy commented on how good it smelled. Result! The second bottle is labelled as Detox. The bottle states 'Gets you clean like rehab can't'. Again on the rear of the bottle there's the usual witty blurb. This time it's about various stars including Jim Belushi, Jim Morrison and Jimi Hendrix. None of whom were noted for their personal hygiene. Jim Morrison for example often wore his jeans for 3 weeks at at time between washes...oh dear. I actually used this product for the first time only this week and again upon opening the stylish tube, was struck by the great smell. Again, just like Fresh, really clean smelling without being overly fragranced or any unpleasant artificial chemical smell like many other products on the market. It's clearly a masculine fragrance and once again as with Fresh, the feel of the product when using does not let it down. No stickiness, or greasiness, just a great invigorating, clean feeling when used. A great wash that can be used time and time again with refreshing results each time. It's also great to know that all Manatomicals products are Paraben free (yay) so another top result and as with Fresh, something I'd be happy to get again and again. So would I get more Rehab? Yeah, yeah, yeah. What are you doing reading sad books Mrs?! Haha. I can't read anything at the mo or I will just weep for no apparent reason. Hormones ... aren't they lovely? Hehe. Lol! I know....BAD idea!!! I cried watching Saturday Night Takeaway this weekend - I mean, seriously?!! lol! I did cackle at your photo lol... oops bad Rachel, but Ive never seen someone cry when wearing a facemask and what a funky outcome! Lol! I love the names, they are so amusing!! Lol it is a funny photo! I'm glad I was wearing the mask as seeing the tear stains cheered me back up again lol! Jon came in and burst out laughing at me! Lol!! I know, its quite a look! 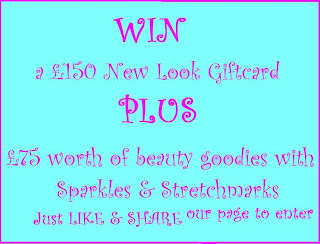 Claire's Castle blog - visit me! They are lovely! :) I'll check out your blog too! Ah sweetheart, what book were you reading?